One of the problems Republicans now have is who do they elect as their candidate for the 2016 elections. So far, eleven people are still running. The New Hampshire primary may winnow the field somewhat, but some candidates are convinced they can make it through the February primaries including Navada and South Caroline, to Super Tuesday when most of the southern states have their primaries. It’s a pipe dream of many in the field, and it is possible that Donald Trump will only be a memory by that time. This is not likely, but anything can still happen. The problem to which I am alluding is caused by this wealth of really good Republican candidates. It is time to get the field down to a precious few. Two is a good number with which to exit Super Tuesday, which means that any candidate that is polling less than 20 percent should hang-up their spurs and get out of the rodeo. The reason is that we need to stop the bleeding that is part of a tough primary season, and start concentrating on the real competition, the presumptive Democrat candidate, Hillary Clinton. The Republican Party needs to come together by thinning the intra-party competition. This means that several candidates have to go. The Republican Party needs to come together like hippies in the Age of Aquarius, hair and all. 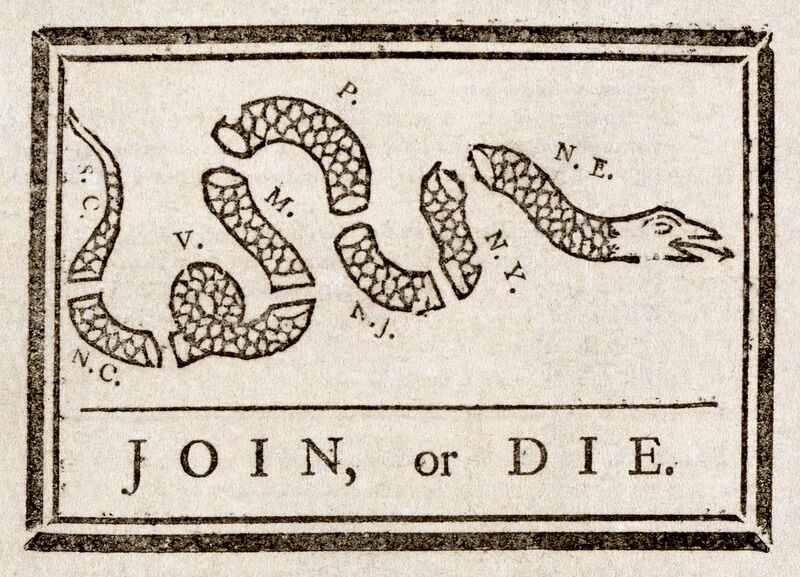 Remember the old “united we stand” motto? Well, thanks to the wisdom of Benjamin Franklin there is another appropriate phrase that even has its own logo. If the Republicans cannot join together the disparate parts of their Party, well, the Party could die. This may be the best opportunity to gain the White House in a generation, and we cannot afford to waste it. As this election season goes on and on, it is hard to get used to the idea that Donald Trump may very well be the Republican presidential candidate. With fourteen Republican candidates, you would think that the poll numbers would be closer that they are, but Trump is polling about forty-percent nationally right now. It is looking more and more like The Donald will be our man. Trump has the ability to make almost every issue a personal issue. All issues are subordinate to his opinion, and no other idea or opinion has currency. Take for example the revelation in last night’s CNN debate that Trump had no clue what the triad, the nuclear strategy of the USA is. This is kind of a basic building block that is a legacy of the cold war, but still remains in effect. Triad means that we can launch nuclear weapons from airplanes, submarines, and from land-based missile silos, hence the triad. In Trump’s parlance the triad strategy makes little difference because he didn’t know about it. He hand-waived the idea that this knowledge was important to anything or anybody. This is the way the man operates. If it isn’t about him he doesn’t want to talk about it. So, what does this have to do with Andrew Jackson, the first Democrat President elected in history, and the founder of the Democrat Party? It is surprising how the two men compare. There were about three things that Andrew Jackson hated, and I mean really hated in his life. First, there were the British. Some of Jackson’s family died in the Revolutionary War, primarily due to the hardships forced on the colonists by the British. The next group of people to earn Jackson’s enmity were the American Indians. Andrew Jackson was responsible for the Trail of Tears forced on the Cherokee, Creeks, and Choctaw. The third group were people that he either didn’t like, or insulted him or his family in some way. Trump and Jackson compare with the fact that if the conversation isn’t about them, they are not interested. They are alike in that they both achieved wealth to a degree in their personal lives.They are also alike in that they both exhibit courage. You simply don’t mess around with this type of person because they will hurt you. Reference Trump’s defense against Jeb Bush where Trump made it personal and threw personal insults at Bush. Andrew Jackson didn’t like the Director of The National Bank, so he didn’t renew the bank’s charter. That’s the kind of guy we are talking about. If Trump were elected what could we expect? I am afraid that what we see is what we get. I don’t think there are any deeper thoughts or governing strategies other than what we see on stage. After all, he is all about the stage and poll numbers. Why do you like Donald Trump and why do so many people say they will vote for him?